Some people like cooking Thanksgiving dinner. Others like decorating the Thanksgiving table. Our Thanksgiving table decor makes things easy if you are the cook. And gives you lots to work with if you are in charge of the Thanksgiving table decorations. Charming fat Turkeys waddle all over these paper party goods. They'll dress up Thanksgiving dinner. Now all you have to do is dress the turkey. Read our tips for Thanksgiving table decor below. 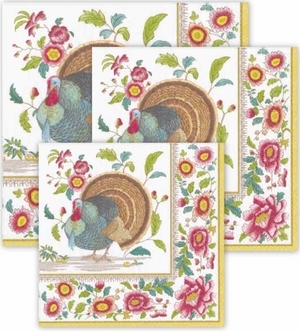 See our Thanksgiving Decor page for Thanksgiving place cards, Thanksgiving placemats, table runners, Thanksgiving paper plates, Thanksgiving napkins and Thanksgiving hand towels.. Mix a bunch of seasonal gourds, pumpkins, squash, cranberries and fall leaves together for a Thanksgiving centerpiece and you're sure to get lots of compliments on your Thanksgiving table decor. A nice walk outside before Thanksgiving dinner is a wonderful idea wherever you live. But if you decide to stay close to the kitchen, our Autumn Farm Thanksgiving table decor is nice to have on the table. Even if your Thanksgiving dinner is all vegetarian, it�s nice to have a few uncooked turkey decorations strutting on the table among the fresh pumpkins, tart cranberries, yellow squash, creamy sweet potatoes, roasted chestnuts and other yummy vegetables of the season and from the farm. Another thing I love about our Thanksgiving table decor is that it puts the turkey, the greatest symbol of Thanksgiving front and center. A roasted turkey is a part of the traditional All-American Thanksgiving feast. But besides as a main course, there are many ways besides Thanksgiving paper napkins and paper plates to incorporate turkey decorations into your Thanksgiving dinner table decor. Some people put chocolate turkeys at everyone�s place. Others make turkey shaped cookies or use turkey Thanksgiving place cards. The only problem with turkey cookies and chocolate turkeys is I never know what part to eat first. I do know that one of the first things I start to think about when Thanksgiving time comes along is how to decorate the table for Thanksgiving. I like to do flower and vegetable centerpieces myself but for napkins and things like that, I like using paper Thanksgiving table decor. It's so much easier than linen and the Thanksgiving decorations on the paper party supplies are great for Thanksgiving table decor. Thanksgiving paper plates and napkins, decorative Thanksgiving hand towels and Thanksgiving place cards, make clean up a snap and leave more time for touch football or watching my team on television after Thanksgiving dinner. And yes, of course, you can use our Thanksgiving table decor for Christmas dinner too. 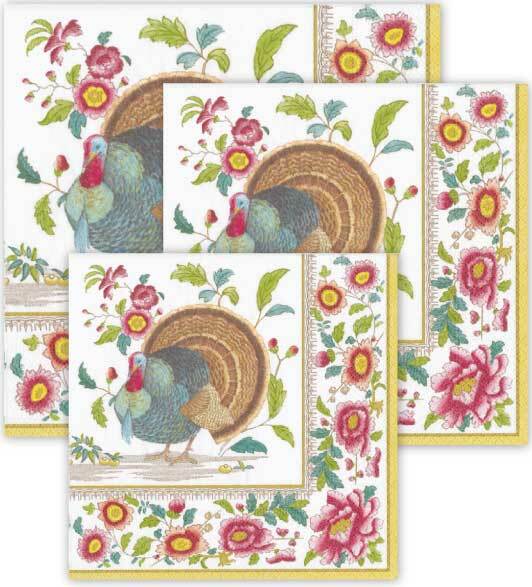 See our Thanksgiving place cards page for lots of placecard options.